After being responsible for a devastating civil war among Christians in 1990, which they have never faced responsibility for, and which has led to 15 years of Syrian occupation and 10 years of Hezbollah terror. 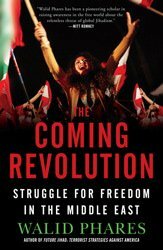 After having blocked any liberation of Lebanon by the Cedars Revolution, after having entered in coalition with Hezbollah in 2005, 2006 and having endorsed Hezbollah's invasion in 2008. 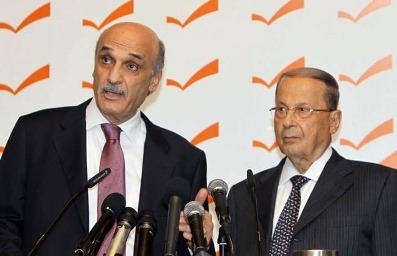 After having been sitting on the necks of the Lebanese Christians for 30 years, wasting time with their endless disputes, calculating their political gains over the people's national interest, Samir Geagea and Michel Aoun finally ended up where they should have been from the beginning: together, in failures and mediocrity. They have united the Christians? Absolutely not. They have united their own political interests. They have contained Hezbollah? Absolutely not, they have been contained like sheep by Hezbollah and Iran. Aoun is in Iran's pocket, and Geagea is now in support of Aoun, entering Iran's other pocket. Hezbollah won the game. If the choice is between Frangieh and Aoun, what kind of a choice is that? Between the ally of Nasrallah and the ally of Assad? Aoun's partisans are delighted to have Geagea support their boss, who is Nasrallah's man. Geagea's men are running around telling the Christians, our boss is intelligent, he knows what he is doing. That's the best way to get out of it. Out of what? Out of the pit that both Geagea and Aoun have thrown the Christians in since 1990 and again after 2005. This is no intelligence, this is cold calculations on behalf of politicians to secure political office and political survival. The difference with the 1990s and the 1980s, Dr Geagea and General Aoun, and today, is that people aren't dumb, aren't uninformed and have ways to communicate and expose political opportunism and corruption. You have betrayed the trust of the Christian people in you. For your past battles against the Syrians are now erased from your credit. Like Petain, a hero of France during WWI and a collaborator with the Nazis during WWII, you have become the Petains of 2016. Aoun at the Presidency? Good luck. Geagea winning seats at the cabinet and being received by Rouhani in Tehran. Good luck. You can go far after becoming Hezbollah's Petains. But one place you aren't going back to: The hearts of a majority of Lebanese and of the Christian people of Lebanon. And you will see it by yourselves, soon. Tom Harb, Cedars Revolution Secretary General, Washington D.C.